Many of us had a boogeyman in our childhood, a story of a supernatural being who would steal us away unless we obeyed our mothers. As we grew older we stopped believing in such preposterous cautionary tales, but Pipeline Theatre Company's The Gray Man suggests that maybe the boogeyman never went away, that he was only waiting, watching, plotting the perfect bait to ensnare his prey. The play opens in darkness; the only sound is a child singing. When the lights finally come up we are introduced to Simon (Daniel Johnson), a man grieving the death of his mother. His mother's tales of the terrifying Gray Man growing up have left him paranoid and afraid to live on his own, and his friend John (Shane Zeigler) is persistent in trying to get him out of the house. In the apartment building across from Simon lives the young Grace (Tahlia Ellie), who forms an unlikely friendship with him through their shared fear of the Gray Man. As a string of child disappearances sweeps the city block, Simon starts to believe that the monster from his childhood is behind the strange happenings, and he fears that Grace could be the Gray Man's next victim. The Gray Man excels in every possible department for a stage production, but two things in particular make it stand out above others: Andrew Farmer's script and Christopher Bowser's lighting design. Farmer's writing flows effortlessly from casual dialogue to bloodcurdling dread, with a surprising amount of comedy as well. Bowser's lighting gives the play everything it needs to hold an audience in fear and suspense; he knows precisely how much or how little light a scene needs. One chilling sequence in particular takes place lit only by a dim lantern. Director Andrew Neisler stages the action around a single set piece that represents Simon's apartment, constructed in a way that an audience on one side of the stage will see a slightly different picture than those on the other. Neisler and casting director Rebecca Feldman have also assembled an impressive assortment of actors to portray their haunted cast of characters. Daniel Johnson plays our hero Simon with the appropriate amount of anxiety and awkwardness of a paranoid shut-in, but manages to portray a sympathetic likability for the audience to root -- and fear -- for. 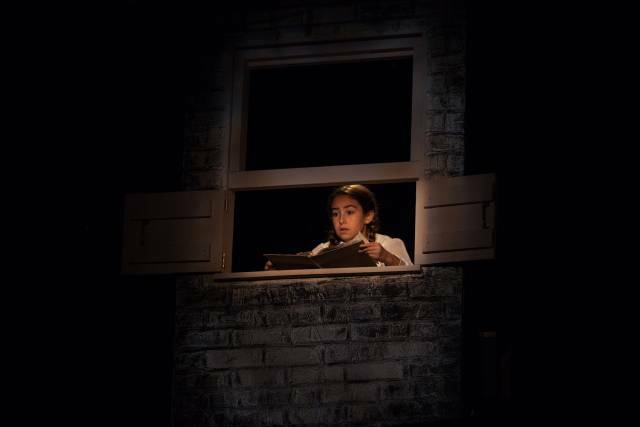 The young Tahlia Ellie acts with impressive subtlety and nails the wonder and innocence of the impressionable Grace, and Shane Zeigler's John is that fun-loving friend we've all had and brings some much needed levity to this dark production. Additionally, Katharine Lorraine and Claire Rothrock portray a chorus of foreboding mothers reciting the story of the Gray Man between scenes, as well as Simon's neighbors in some more lighthearted instances. The Gray Man is a dark and suspenseful production that keeps the audience anxious to see what happens next while covering their eyes in fear, and the perfect outing to embrace the spirit of the season.